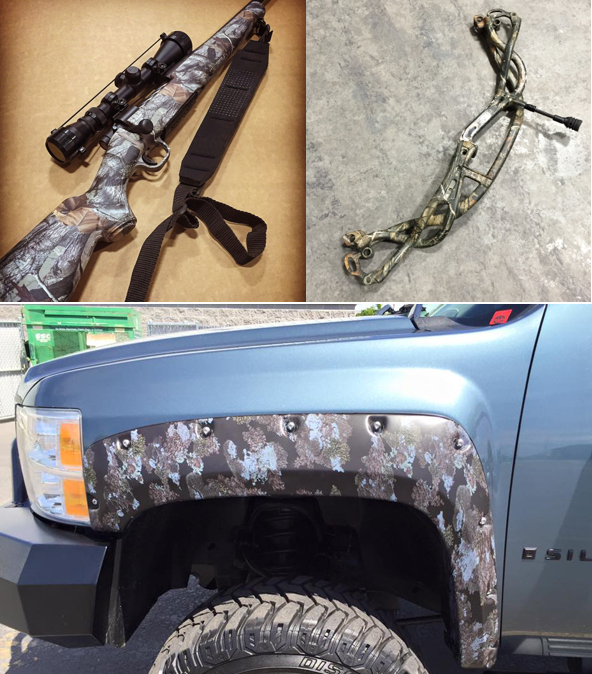 During the month of September, Adaptive Graphx will take 20 percent off finishes and coatings for rifles, bows or vehicles. Nampa, Idaho (September 2017) – Adaptive Graphx, industry experts in custom water transfer printing and Cerakote® firearm coatings, will be running a September Pre-Rut Special now through Sept. 30, 2017. Adaptive Graphx is offering 20 percent off any water transfer printing or Cerakote® firearm coating off any rifle, bow or vehicle, providing a little extra insurance so that you won’t get busted in the field by an educated animal. For more information on Adaptive Graphx, visit www.adaptivegraphx.com or “Like” us on Facebook and “Follow” us on Instagram. For more information on Adaptive Tactical or StōnCamo, visit www.adaptivetactical.com and www.stoncamo.com. This entry was posted on Monday, September 11th, 2017 at 23:28	and is filed under Camo, Press Release. You can follow any responses to this entry through the RSS 2.0 feed. Both comments and pings are currently closed. We have about $55,000 between our 401k accounts.